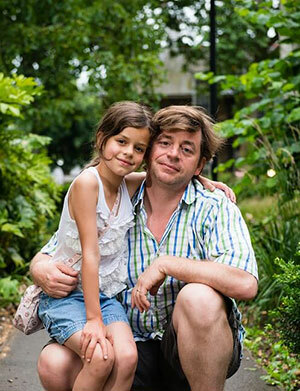 Diabetes dads have sleepless nights too, says Andrew Stroud, whose daughter Bia, nine, has had Type 1 since she was five. ‘When Bia was diagnosed her mother was very much for getting on with life day by day, but I wanted to reach out for help and information – although I’d never done that before. I joined an online diabetes support group and then went to a JDRF event for families. It was very emotional and I realised this was a very close-knit community. On diabetes message boards, you sometimes get the impression that mums do everything for their child and men don’t do much. So I speak up on behalf of the diabetes dads! It’s not just about going off to work and being the breadwinner. My wife and I are both involved with Bia’s care all the time. I do the school run most days and I check on Bia through the night. We ensure she has a normal life, but every so often – such as when Bia forgot to re-attach her insulin pump after a bath – you realise that Type 1 is a very serious illness, and there is no time off. Andrew is a member of the Families With Diabetes National Network and of the Diabetes UK Lewisham, Lambeth and Southwark Support Group. Dan Piper, 26, is the third generation of his family to have Type 1 diabetes. How does he feel about becoming a father himself? ‘I’ve been aware of diabetes all my life as my grandfather had Type 1 and my father was diagnosed with Type 1 when I was 18. We’ve always been close; to me he was Superman and I didn’t like the idea that he was ‘ill’, so I avoided the issue. When I was diagnosed with Type 1 diabetes five years later, aged 23, it wasn’t exactly a surprise, because of my family history, but it was still a shock. Although I understood my genetic predisposition, I got very frustrated and angry that I’d done nothing to deserve having diabetes. At that time it was really comforting to be able to talk to my father, to vent my anger, ask him lots of questions about diabetes: I could say anything at all because anything I was experiencing, he’d experienced too. He’s a great role model as he’s healthy and active: I think if my dad can do it, I can do it too. I was always fit and sporty but since my diagnosis I’ve learned a lot more about my health. I almost think of Type 1 diabetes as quite a healthy condition to have, because it makes you look after yourself really well. We’d love to hear about your experiences of being a ‘diabetes dad’, or whether becoming a father changed your attitude to your own diabetes. And do diabetes mums do all the work? Please share on our Facebook page!